Forget about using this one if you have weak TV signals. 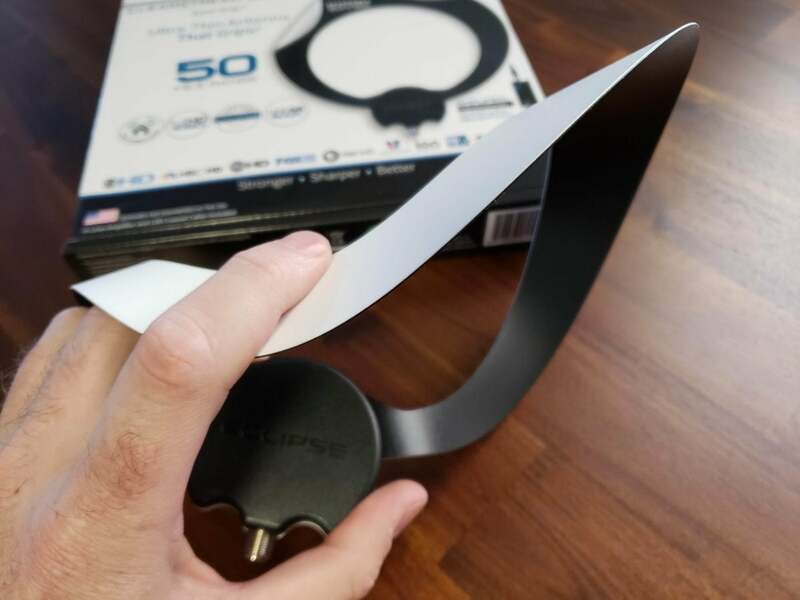 The Clearstream Eclipse is a small, flat TV antenna designed for reception in areas where TV signals are strong or very strong: Typically that’s anywhere up to about 20 miles from a TV transmitter (although local topography can reduce that). The circular antenna is meant to be used indoors, stuck up against a window or wall. For best reception, you should place it as high as possible and in a window facing the direction of the TV broadcast tower for your area. The Eclipse can be purchased with or without a signal amplifier, for a difference of $20. We opted for the Amplified model to get maximum performance. But while the amplifier might help some, the small size of the antenna is itself a limitation to pulling in weaker distant stations. For that, you’ll need a larger antenna. The Clearstream Eclipse is black on one side and white on the other. The Eclipse did well in tests, successfully receiving seven broadcast channels for a total of 38 digital TV stations. An additional channel was decoded but wasn’t strong enough for constant viewing. The Eclipse is only designed for UHF reception and its size means it will only work well in areas where there are strong broadcast signals. The lack of VHF-High reception is an unfortunate omission. The band is used by major TV networks in many cities across the U.S. and it seems many customers will be disappointed if they can’t be received. We got better results from the the larger Clearstream Flex antenna and recommend that over the Eclipse. 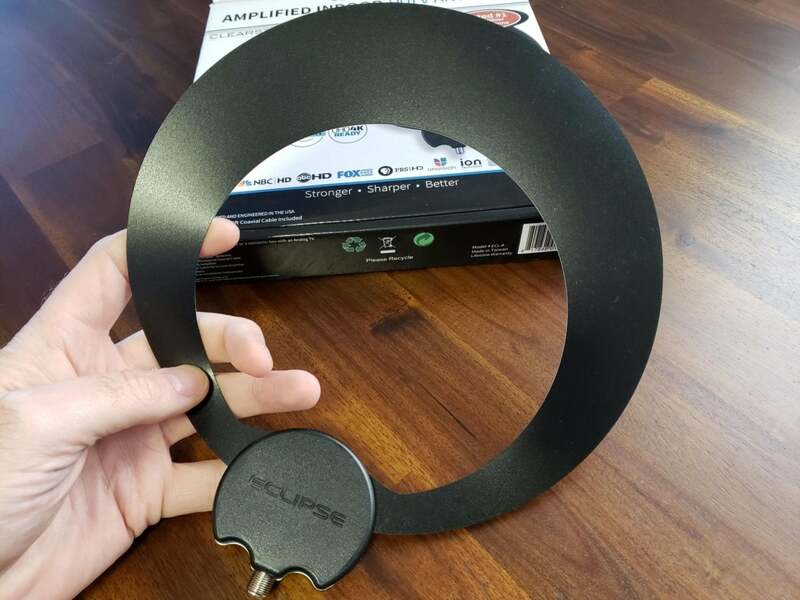 The Eclipse Amplified is supplied with 12 feet of coaxial cable, an amplifier, power supply for the amplifier, a sticky strip to put adhere the antenna to a window or wall, and an additional 3 feet of coaxial cable to run from the amplifier to your TV. Older versions used a dedicated power supply for the amplifier but newer versions use USB power. This means you can plug the amplifier into a USB socket on your TV, if it has one, and then it’s only powered when the TV is on. If your TV doesn’t have USB, a power adapter is included for use in an outlet. The Eclipse does an acceptable job pulling in strong, local UHF stations but there are better options out there. 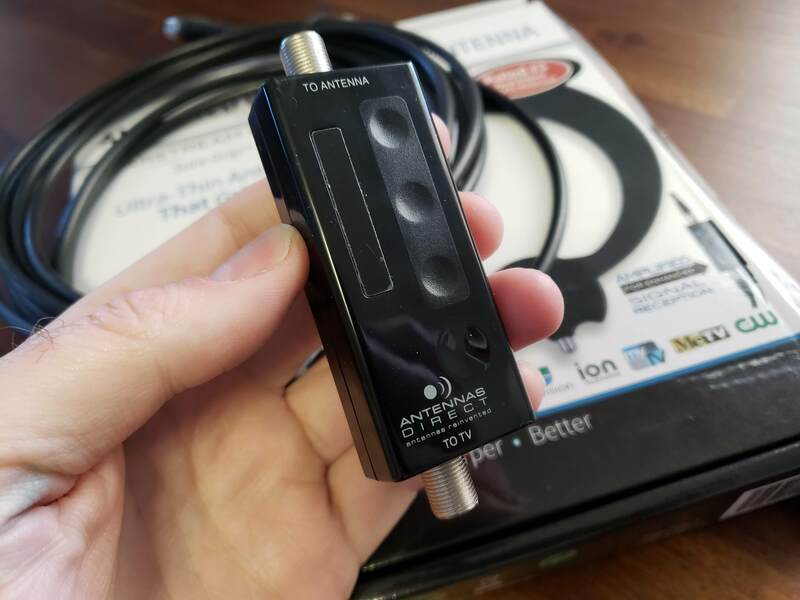 If your city doesn’t have any VHF stations currently (or is about to get them as part of the national spectrum repack) and you’re near the transmitter, this might work for you. Otherwise, check our top picks for indoor antenna and remember that an indoor antenna is always a compromise. You’ll always do better with a decent outdoor antenna. The Eclipse is a small, compact TV antenna designed for places like cities with strong TV signals and no room for external antennas.